This course traces the development of Hindu and Buddhist worlds in Java through archaeology, art, texts, and performance. During our trip to Indonesia, we will investigate the remains of Hindu and Buddhist sites in the mountains and plains of central java. We will also see traditional Javanese art forms including Wayang (shadow play) and court dance. We will visit the ruins of the Buddhist center of Borobadur, the Hindu complex at Prembanan, as well as the ruins of the Dieng Plateau and Candi Sukh. We will experience the persistence of traditional art forms in court life at the Jogjakarta Palace, and we will explore the role of traditional art forms in modern political and cultural life in Solo. This course focuses on the social history of the performing arts in modern South India and their interface with larger discourses on religion, gender, nation, and modernity. The course is centered on three allied performance traditions: Karnatak music, Bharatanatyam dance, and Tamil Kuttu theater. During our visit to India, we will travel to sites associated with performance, including temples and palaces such as those in the cities of Thanjavur and Pudukkottai. We will also spend time in the cities of Hyderabad and Chennai to examine modes of contemporary cultural production in these globalized cities, and travel to small towns and villages such as Mummidivaram to meet with artists from former courtesan communities. The course fosters a deep and sensitive understanding of both the power and politics of performance in the cultural life of modern South India. 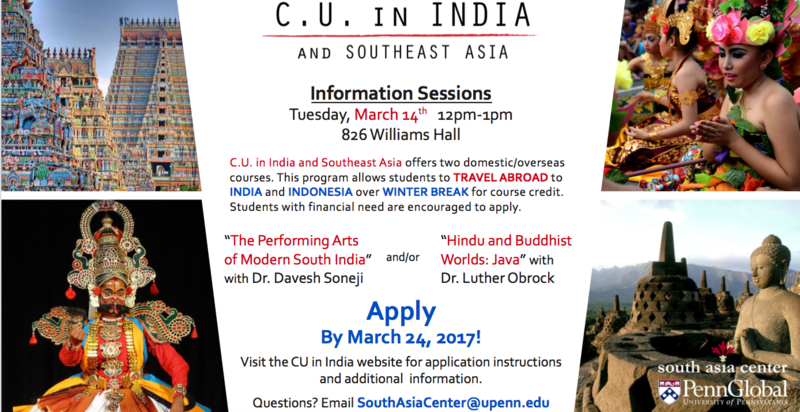 To learn more about the CU in India and Southeast Asia Program, come to our Info Session! To learn more and access the CU in India Application, visit the CU in India website (http://web.sas.upenn.edu/cuinindia/) or contact Amelia Carter (SouthAsiaCenter@upenn.edu or 215-898-4490) for more information. Applications for the 2017-18 CU in India Program are due March 24, 2017.